LAKE BUENA VISTA, Fla. – November 9, 2014 – In his first attempt at running a half marathon, Chris Sorrick of Tampa raced away with the Disney Wine & Dine Half Marathon on Saturday night at Walt Disney World Resort near Orlando. With a winning time of 1 hour, 17 minutes, 39 seconds, Sorrick, 21, finished more than a minute ahead of second-place finisher Cliff Gerber of East Brunswick, NJ (1:18:55) and nearly two minutes in front of third-place finisher Jerry Lawson of Jacksonville, Fl.. The only challenge Sorrick faced was a steady rain that made the 13.1-mile course a little slick. Jenn Berry of Denver was the first female finisher with a time of 1:27:59. It was Berry’s third straight runDisney victory after winning the 10K and half marathon during the Disneyland Half Marathon Weekend this summer. 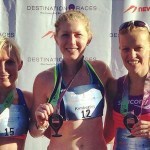 Keara Thomas of Chapel Hill, NC was second (1:28:28) and Nicole Downin (1:28:58) was third. The Disney Wine & Dine Half Marathon, the second runDisney night race this year, capped a sold-out weekend of events that featured more than 18,000 runners, including more than 13,000 that ran the 13.1-mile race through multiple Disney theme parks. The runners celebrated their accomplishment with an exclusive after-hours Finish Line Party at the Epcot International Food & Wine Festival, featuring more than 25 kiosks offering fine cuisine and wine, plus Disney characters, musical performances and the opportunity to ride signature Epcot attractions. The race began at ESPN Wide World of Sports Complex and weaved through Disney’s Animal Kingdom and Disney’s Hollywood Studios before finishing at the Epcot International Food & Wine Festival. All finishers received a one-time-only fifth annual medal. 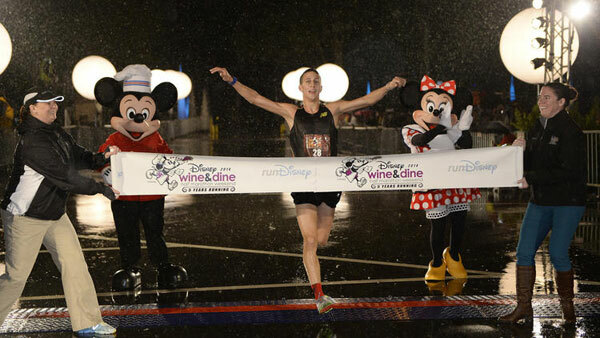 Registration for the 2015 Disney Wine & Dine Half Marathon starts on March 17, 2015.